NOTE: Substitute '.' for '%7Bdot%7D'. Welcome to your own Private Beach! Welcome to Relaxation! Welcome to Paradise! 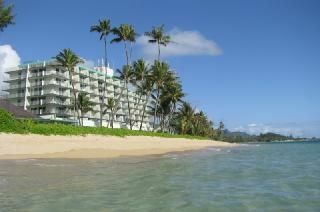 This paradise condo is located on the world famous North Shore of Oahu on the eastern tip. The beautiful, secluded, white sand beach is just 20 steps away. The beach is protected by a reef. Nicely appointed in Hawaiiana style with wicker furniture, art work & decoration. Sleeps 4 adults comfortably with Queen bed in bedroom and additional pull-down Queen Murphy bed in living area. Full kitchen with stovetop, oven, toaster, blender, microwave, coffee maker, refrigerator, dinnerware & utensils. Dining room table seats 4. Lanai (balcony) overlooks the beach! Watch the waves from the unit and fall asleep to their soothing sound as they roll onto the beach. Or, enjoy the breathtaking sunrises and moonrises over the water. Come trade the crowds & skyscrapers of Waikiki for palm trees and beautiful surf against the backdrop of old Hawai'i--the real Hawai'i! To give you an idea of the beauty of this side of the island Gilligan's Island, LOST, Jurassic Park & other movies were filmed in the area. Shower and tub. Recently remodeled! The location was fantastic. Right on the beach with a great vantage point overlooking the beach from the fifth floor. Extremely close to many things to do on that side of the island. The condo was very clean and ample space for my family of 3. Great Value million dollar View! Cozy unit with all the basic amenities you will need, won't beat the beachfront location or View for the price! Previous reviews are accurate. Building requires a bit of maintenance but great value... well located for day trips too! We would certainly stay here again. Great location; close to everything yet private beach! The view was just beautiful !! Relaxing, fully equipped kitchen and boggie boards and snorkeling equipment too!! We used the Murphy bed as you you look into the ocean. It was very comfortable. The condo was an excellent value. Great location if you want to get away from the crowds. The beach was so relaxing and ocean waters calm. Saw many varieties fish and even a monk seal and turtle. Was able to rent a paddle board the for the day to use right out front. This made for such a relaxing holiday as we toured around the island but always looked forward to returning to Barbeque and enjoy the evenings back at this home away from home. The murphy bed in the front room was the best for falling asleep to the ocean sounds. Would definitely recommend. Thank you Tracy and so happy to hear that you had a great time. Welcome back anytime! Perfect location - right on the beach!!! The condo was perfect for our family of three! We were given excellent information on getting to the condo, how to check-in, etc., activities to consider and so on. The condo (and the building in general) was clean and quiet. Being right on the beach was beyond perfect - the sunrises, the sound of the ocean - just incredible! And the mountains were so gorgeous. Overall, our stay was wonderful and we're looking forward to going back! The condo is nice, clean and cozy. You are started with the necessary supplies needed from kitchen supplies, bathroom supplies and linens. Killer ocean views, private beach and nearby activities are definitely the selling point. I spent 3 days here, 6 days in Waikiki, I wish it had been the other way around. I would definitely recommend this place for your next vacation to Oahu, I know I'll be back! Below is a partial list of nearby sights and activities. • Fishing (5 min) - Arguably the best surf fishing on Oahu! • Hiking (10 min) - Ends at a waterfall & swimming pool! • Surfing (10 min) - The world's best! • Waimea Bay & Audubon Center (15 min) - Breathtaking! • Arnold Palmer Golf Course (15 min) - World class! • Byodoin Temple - Valley of the Temples (15 min) - Real Japanese temple nestled in the hills.